By LUDWIG VON KOOPA - Dedicating a whole log to just Fortnite seemed cruel. 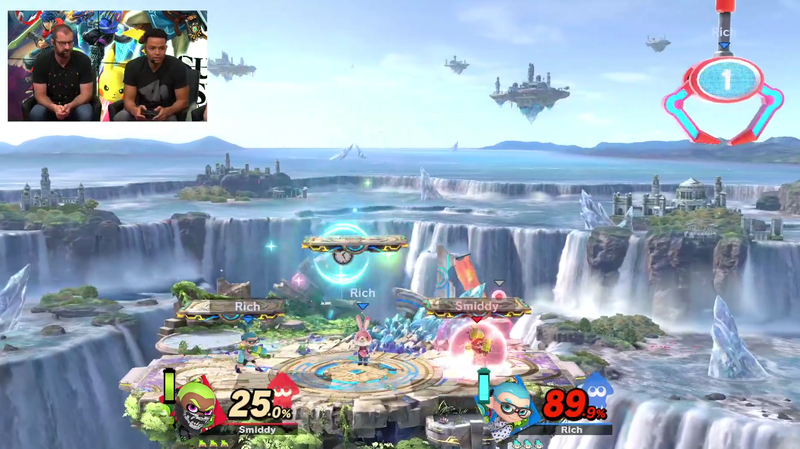 At first, it looked like we'd dedicate a whole KoopaTV article to being a reaction log to Fortnite, but Nintendo was fortunate enough to show Super Smash Bros. 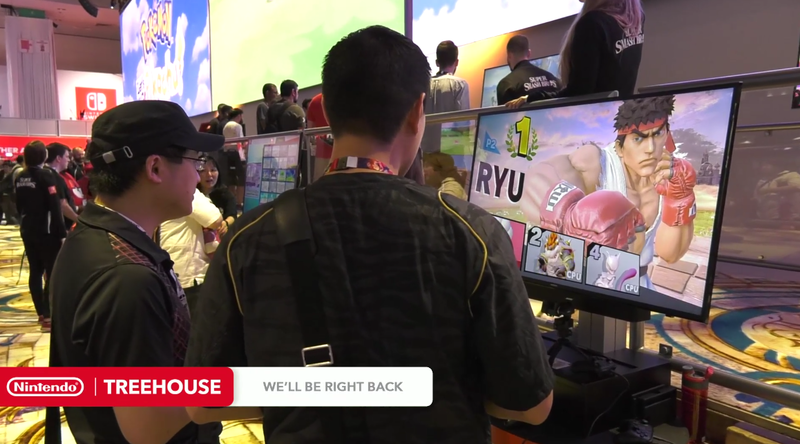 Ultimate right afterward for their Nintendo Treehouse Live | E3 2018 series. So it's a combined log. You're joined by me and Rawk. Ryu appears at the end. KoopaTV's E3 Weeks 2018 Schedule is chock-full of making sense of all the content for E3 2018! [2:15 PM] RawkHawk2010: We need +1000 Event Matches. [2:15 PM] RawkHawk2010: You can't object that. [2:15 PM] Ludwig Von Koopa: and I object to this log. [2:16 PM] RawkHawk2010: Doubt we care about Fortnite. [2:16 PM] Ludwig Von Koopa: Fortnite is gonna get more ire than ARMS. [2:16 PM] Ludwig Von Koopa: Well probably not. [2:16 PM] Ludwig Von Koopa: Nintendo cares about ARMS. [2:16 PM] Ludwig Von Koopa: They won't talk about Fortnite after today. [2:16 PM] Ludwig Von Koopa: ??? [2:17 PM] RawkHawk2010: They probably will. [2:17 PM] Ludwig Von Koopa: It's not their game! [2:17 PM] RawkHawk2010: Fortnite is the most popular game in the world. [2:17 PM] RawkHawk2010: And it's coming to Switch. [2:17 PM] Ludwig Von Koopa: It's not coming to. [2:17 PM] Ludwig Von Koopa: It's out. [2:17 PM] Ludwig Von Koopa: As of 77 minutes ago. [2:17 PM] RawkHawk2010: I still can't believe Daisy is one of three newcomers. [2:18 PM] RawkHawk2010: I feel trolled particularly. [2:18 PM] Ludwig Von Koopa: Why you? [2:18 PM] RawkHawk2010: Does everyone hate Daisy? [2:18 PM] Ludwig Von Koopa: Yeah, everyone hates Daisy. [2:18 PM] Ludwig Von Koopa: So why are YOU PARTICULARLY trolled? [2:18 PM] RawkHawk2010: I didn't think everyone hated her. [2:18 PM] Ludwig Von Koopa: Daisy actually had a contingent of fans on Miiverse. [2:18 PM] Ludwig Von Koopa: I think I defriended a major Daisy supporter. [2:19 PM] Ludwig Von Koopa: Since I didn't want to keep reading her Daisy crap on my Activity Feed. [2:20 PM] Ludwig Von Koopa: Should I try Fortnite once? [2:20 PM] RawkHawk2010: Is it free? [2:20 PM] Ludwig Von Koopa: Yes. [2:22 PM] Ludwig Von Koopa: Will you? [2:23 PM] Ludwig Von Koopa: When'd you get here? [2:23 PM] Ludwig Von Koopa: Are they gonna have Nintendo costumes in this? [2:23 PM] Ludwig Von Koopa: I miss that one second where we thought Fortnite was Viva Pinata. [2:23 PM] Ludwig Von Koopa: You can buy "Battle Pass". [2:23 PM] Ludwig Von Koopa: To get cosmetic stuff I guess. [2:24 PM] Ludwig Von Koopa: Time-exclusive cosmetics. [2:25 PM] RawkHawk2010: Pikachu is screaming in the background. [2:27 PM] Ludwig Von Koopa: Cross-play between PC, Xbox One, mobile, Mac. 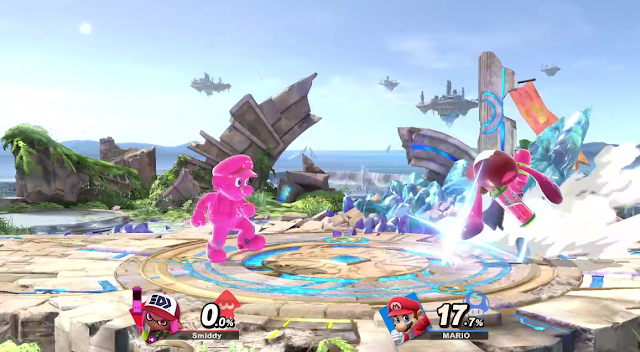 [2:27 PM] RawkHawk2010: Knuckles is an Assist Trophy. [2:28 PM] RawkHawk2010: ^ And Pauline is shown on stage in that. [2:29 PM] Ludwig Von Koopa: These guys have nothing to talk about for Fortnite. [2:30 PM] RawkHawk2010: Wake me up for Tennis. [2:31 PM] RawkHawk2010: Oh yeah FighterZ Switch is a thing. [2:31 PM] Ludwig Von Koopa: Yeah we know. [2:32 PM] RawkHawk2010: Ya I was just saying it again in case we forgot. [2:35 PM] Ludwig Von Koopa: They're babbling about particular weapons in Fortnite. [2:38 PM] Ludwig Von Koopa: You know what's fascinating? [2:38 PM] Ludwig Von Koopa: Hundreds of thousands or more people watch streamers play Fortnite. [2:38 PM] Ludwig Von Koopa: For hours on end. [2:38 PM] Ludwig Von Koopa: "We're getting a little low on time." [2:38 PM] RawkHawk2010: And then watching streamers play Sea of Thieves turned out to be boring. [2:40 PM] Ludwig Von Koopa: Smash next. [2:40 PM] Ludwig Von Koopa: Featuring Inklings. [2:40 PM] Ludwig Von Koopa: Do I want to share that log with Fortnite? [2:41 PM] Ludwig Von Koopa: Might as well. [2:44 PM] Ludwig Von Koopa: Back. [2:44 PM] Ludwig Von Koopa: So are they. [2:44 PM] Ludwig Von Koopa: Battlefield and Final Destination are the same place but with platforms. [2:44 PM] Ludwig Von Koopa: Inkling vs. Mari0. [2:45 PM] Ludwig Von Koopa: Mari0 covered in ink. I can't wait to torture the plumber by recolouring him in eight different colours! MWAHAHAHAH! [2:45 PM] Ludwig Von Koopa: That is amazing for screenshot potential. [2:45 PM] Ludwig Von Koopa: Since every Inkling alt colour has different ink colour. [2:45 PM] Ludwig Von Koopa: I don't think anyone has black ink. [2:46 PM] Ludwig Von Koopa: Roller can bury enemies. [2:46 PM] Ludwig Von Koopa: You can't ink the floor. [2:46 PM] Ludwig Von Koopa: But your dash is squid form. [2:47 PM] Ludwig Von Koopa: Squid Jump is up-b, has hitbox at start-up and end. [2:48 PM] Ludwig Von Koopa: Down Smash Slosher, Forward Smash Inkbrush, Up Smash is Blaster. [2:48 PM] Ludwig Von Koopa: Oh, Roller DOES put ink on the ground. [2:48 PM] Ludwig Von Koopa: Enemies move slower. [2:49 PM] RawkHawk2010: Your opinion on what they did to Final Smashes? [2:50 PM] Ludwig Von Koopa: Positive. [2:50 PM] Ludwig Von Koopa: Now they're balanced. [2:50 PM] Ludwig Von Koopa: No more transformations. [2:50 PM] Ludwig Von Koopa: So what's Yoshi's final smash now? [2:50 PM] Ludwig Von Koopa: Yeah, male Inklings get their own voice confirmed. [2:50 PM] RawkHawk2010: I love what happened to Ness's and Lucas's, so that's one compliment from me. [2:51 PM] RawkHawk2010: Yoshi might just do what Super Sonic was. [2:51 PM] Ludwig Von Koopa: Shield is submerged in ink, so can you grab that? [2:51 PM] Ludwig Von Koopa: Whoa, Gold Hammer has a big pixelated sound effect. [2:52 PM] Ludwig Von Koopa: Okay, there is a real shield bubble. I thought he was shut down! [2:52 PM] Ludwig Von Koopa: It's controlling a giant crane. [2:53 PM] Ludwig Von Koopa: Can't wait for the tournament tonight. [2:53 PM] Ludwig Von Koopa: 'cause they'll know what they're doing unlike these Treehousers. [2:53 PM] Ludwig Von Koopa: Shield surfing. [2:54 PM] Ludwig Von Koopa: Rich is not managing his ink. [2:55 PM] Ludwig Von Koopa: Samurai Goroh returns. [2:55 PM] Ludwig Von Koopa: You can ink Samurai Goroh and Bomberman. [2:55 PM] Ludwig Von Koopa: Win poses are from Splatoon. [2:56 PM] RawkHawk2010: ^ From Shulk's page. [2:56 PM] Ludwig Von Koopa: I've missed polar bear. [2:57 PM] Ludwig Von Koopa: I thought we globally warmed him out. [2:58 PM] Ludwig Von Koopa: Changing alt colours is improved. [2:58 PM] Ludwig Von Koopa: You get a view of all the colours to choose from. [2:58 PM] RawkHawk2010: Never needed to leave. [2:58 PM] Ludwig Von Koopa: I thirded Pokémon Trainer in Brawl. [2:58 PM] Ludwig Von Koopa: Don't know if I'll do that again. [2:59 PM] Ludwig Von Koopa: Moray Towers is in Splatfest mode. [2:59 PM] Ludwig Von Koopa: Before, it was in daytime. [2:59 PM] Ludwig Von Koopa: So the music is now the Splatfest music from Splatoon 1. [2:59 PM] Ludwig Von Koopa: Very very nice touch. [2:59 PM] RawkHawk2010: Dunno if I like that box that appears when people start to go out of bounds. [3:00 PM] Ludwig Von Koopa: I'm telling you, as a Splatoon fan, I'm pleased by the Splatoon representation. [3:00 PM] Ludwig Von Koopa: I dunno the point either. [3:00 PM] Ludwig Von Koopa: @Kamek is online but playing ROBLOX. [3:00 PM] Ludwig Von Koopa: So it's probably not him. [3:00 PM] RawkHawk2010: I'm telling you, as not a Splatoon fan, not having a great time. [3:00 PM] RawkHawk2010: Not bad necessarily. [3:00 PM] RawkHawk2010: But I'm not smiling. [3:01 PM] Ludwig Von Koopa: Well four Inklings on a Splatoon stage is meant for Splatoon fanservice by the Treehousers. Note the heal zone in the centre of the screen. [3:01 PM] Ludwig Von Koopa: Is that heal zone item from ARMS? [3:01 PM] RawkHawk2010: Hope not. [3:02 PM] Ludwig Von Koopa: Because it looks like the heal zone item from ARMS. [3:02 PM] Ludwig Von Koopa: But it's also kind of a generic concept. [3:03 PM] Ludwig Von Koopa: The zoomed out box thing might help training mode. [3:03 PM] Ludwig Von Koopa: And practicising directional influence. [3:03 PM] Ludwig Von Koopa: The Crash enemy from Kirby is an Assist Trophy now. [3:03 PM] Ludwig Von Koopa: Bomber. [3:04 PM] Ludwig Von Koopa: "Animal Mascot showdown"
[3:04 PM] Ludwig Von Koopa: Picking stage first is so weird. [3:04 PM] Ludwig Von Koopa: Inkling, Donkey Kong, Fox, Sonic. [3:04 PM] RawkHawk2010: I like the intro-to-battle screen. [3:04 PM] Ludwig Von Koopa: DK's wind-up punch. [3:05 PM] Ludwig Von Koopa: Different animation. [3:05 PM] Ludwig Von Koopa: DK's cargo grab different animation. [3:05 PM] RawkHawk2010: Did she get hit herself? [3:05 PM] Ludwig Von Koopa: Probably at some point. [3:05 PM] RawkHawk2010: I haven't seen very many people attack the ATs. [3:06 PM] Ludwig Von Koopa: Fox has new voice-acting. [3:06 PM] Ludwig Von Koopa: Morgan is literally just suiciding. [3:06 PM] Ludwig Von Koopa: With Fox. [3:06 PM] RawkHawk2010: No one has talked about it. [3:06 PM] Ludwig Von Koopa: That Demon X Machina thing? [3:07 PM] RawkHawk2010: I haven't seen it even referenced on Twitter. [3:07 PM] Ludwig Von Koopa: Fox refuses to Final Smash. [3:07 PM] Ludwig Von Koopa: Oh. [3:07 PM] Ludwig Von Koopa: There. [3:07 PM] Ludwig Von Koopa: It's basically Captain Falcon's. [3:07 PM] Ludwig Von Koopa: With Arwings. [3:07 PM] Ludwig Von Koopa: They're attacking Mother Brain. 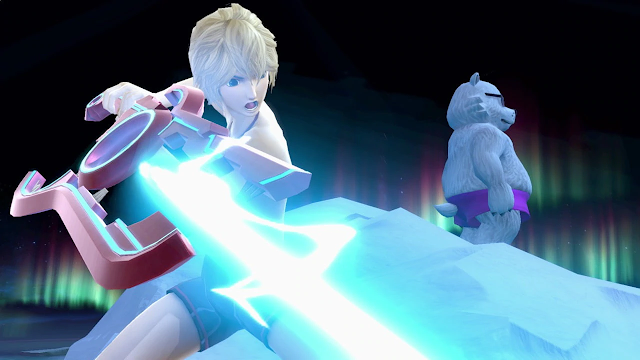 [3:08 PM] RawkHawk2010: Is Krystal the second character created by a Western developer in Smash? [3:08 PM] Ludwig Von Koopa: I don't know the histories of every assist trophy. [3:10 PM] Ludwig Von Koopa: DK wins. [3:10 PM] Ludwig Von Koopa: He wasn't grinning. [3:10 PM] Ludwig Von Koopa: He was kinda angry. [3:10 PM] Ludwig Von Koopa: Segment over. [3:10 PM] Ludwig Von Koopa: Overcooked! 2 next. [3:10 PM] Ludwig Von Koopa: Transition to Ryu looking STONED. Stay tuned to KoopaTV, staying tuned to Nintendo Treehouse Live. 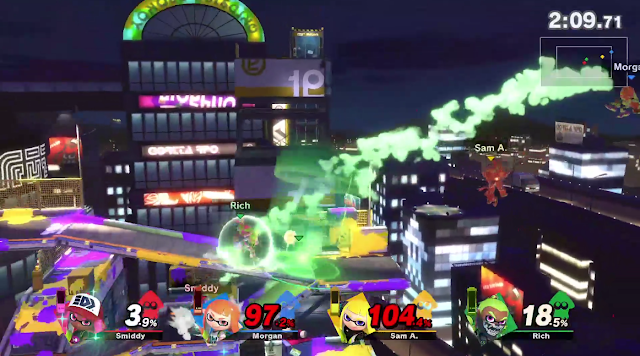 Are the Splatoon fans in the audience pleased by the Inkling representation? 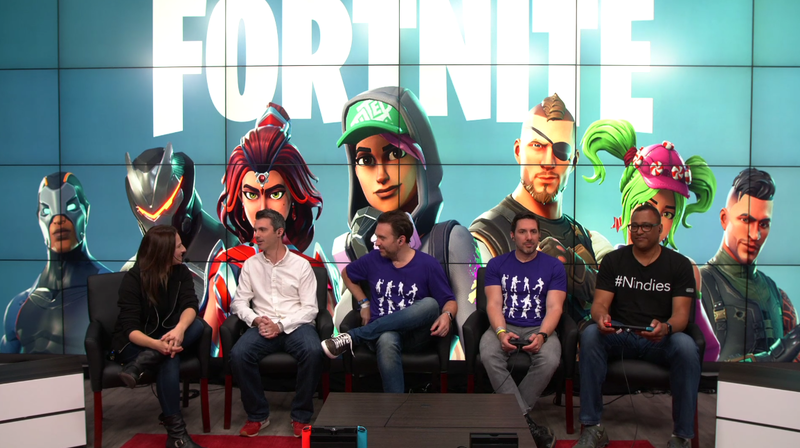 Should the staff try Fortnite? The log before this one was for Pokémon: Let's Go! After this, the Treehouse staff uses Smash Bros. as filler.